Download this 11″ x 17″ print and hang it up in your studio for reference. 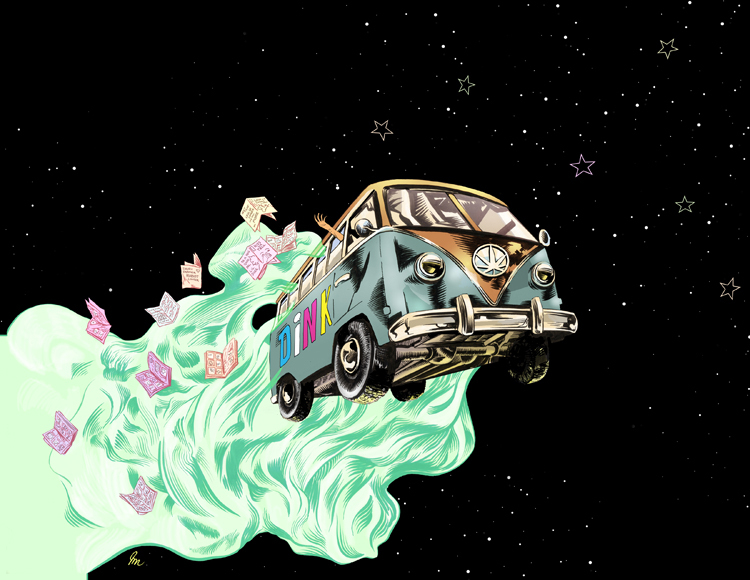 You wouldn’t think it, but comics are a relatively new art form. Sure, people have used drawings to tell stories as far back as the caveman era, but comics as a realized art form are just over a 100 years old. Creators have frequently been flying by the seat of their pants to understand (and work successfully in) comics, with many of them learning for themselves as comics-specific classes are still relatively rare. 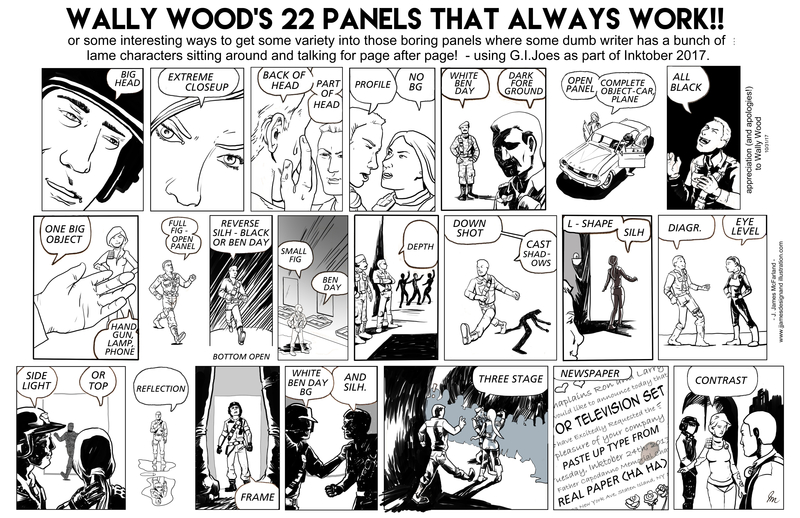 As a guide to help artists avoid common mistakes, writer/artist/editor Larry Hama assembled what would become a key part of any creator’s toolkit: Wally Wood’s 22 Panels That Always Work. 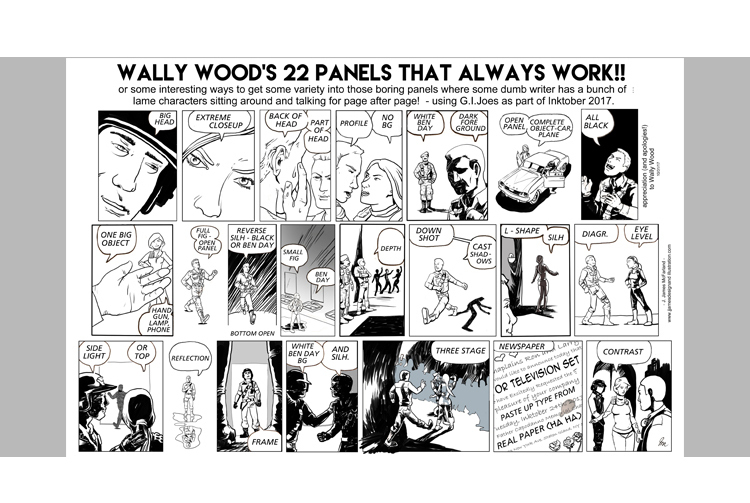 I worked for Wally Wood as his assistant in the early ’70s, mostly on the Sally Forth and Cannon strips he did for the Overseas Weekly. I lettered the strips, ruled borders, swipe-o-graphed reference, penciled backgrounds and did all the other regular stuff as well as alternating with Woody on scripting Cannon and Sally Forth. When I was starting out as an editor at Marvel, I found myself in the position of having to coach fledgling artists on the basics of visual storytelling, and it occurred to me that the reminder sheets would help in that regard, but three eight-by-ten pieces of paper were a bit unwieldy, so I had Robby Carosella, the Marvel photostat guy at the time, make me re-sized copies of all the panels so I could fit them all on one sheet. I over-compensated for the half-inch on the height (letter paper is actually 8 1/2 by 11) so the main body of images once pasted up came a little short. I compensated for that by hand lettering the title. I have redrawn this reference as part of 2017’s “Dancing Joes” themed-InkTober. You may have it for free.